LoJack assists Albuquerque Police in arresting two more auto theft offenders. One who was going to report to pre-trial services. 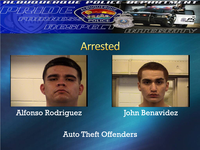 Alfonso Rodriguez, 20, and John Benavidez, 19, were both arrested for Receiving/Transferring a Stolen Vehicle and Possession of Burglary Tools. On 03/30/2017 at about 10 a.m., the Albuquerque Police Department Auto Theft Unit received a silent LoJack alert on a stolen vehicle being identified as a black 2002 GMC Yukon. The signal was coming from an apartment complex in the area of Jefferson and Montgomery. Detectives arrived and observed two males identified as Alfonso Rodriguez and John Benavidez get into the stolen vehicle and drive out of the complex. Rodriguez was identified as the driver and detectives followed as he drove around Albuquerque with no apparent place to go. Rodriguez eventually lead detectives to the area of 5th St and Marble Ave where he parked the stolen vehicle. Both Rodriguez and Benavidez exited the vehicle and began walking towards the Metropolitan Court house. Detectives took both subjects into custody outside without incident. During their investigation, detectives were told by Benavidez they got the vehicle from another male. He said they knew the vehicle was stolen due to the damage to the steering column and they were using a key that did not belong to this vehicle to start it. Rodriguez also admitted he knew the vehicle was stolen and drove it anyway. Rodriguez said his reason for driving the stolen vehicle was because he needed to report to pre-trial services per his conditions of release at Metropolitan Court and did not want to take the bus. Both Rodriguez and Benavidez were arrested and charged with Receiving//Transferring a Stolen Vehicle and Possession of Burglary Tools. Rodriguez was just released from jail on March 29th and was going to pre-trial services on a grand jury indictment for Kidnapping and assault charges from 2016 to be fitted for an ankle monitor. Benavidez has been caught in stolen vehicles in the past, once in December 2016 and once earlier this month. This will be his 3rd auto theft charge in 4 months. The Albuquerque Police Department Auto Theft Unit did an outstanding job getting these two repeat offenders into custody without incident. The LoJack system yet again proved it is a valuable tool for law enforcement in assisting officers in getting offenders into custody, all while keeping the public safe. The system in the victims vehicle was just installed two months prior to the theft and ensured the return of his vehicle.